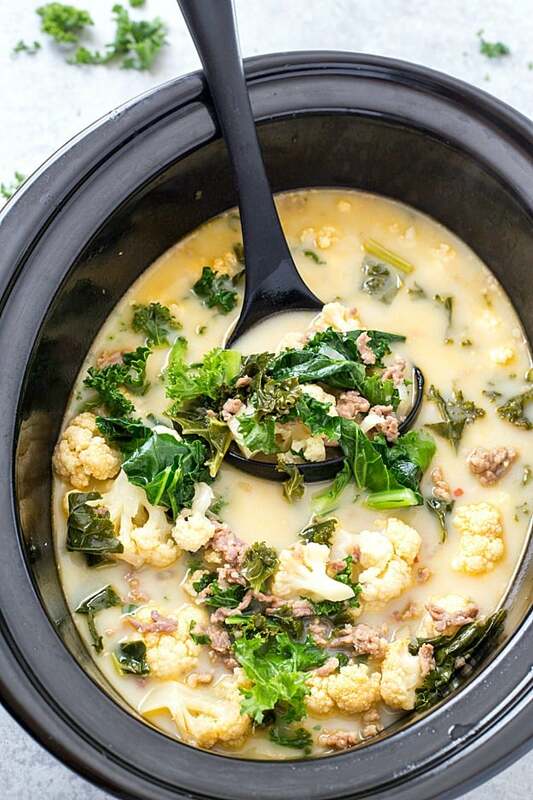 Slow Cooker Low Carb Zuppa Toscana Soup – Skip the trip to your local restaurant and make a batch of this insanely delicious copycat soup! It’s healthy, it’s delicious, and it’s made low carb! Perfect for a low carb and keto-friendly lifestyle! So the other day it was starting to feel like fall – wait, let me say that again, it felt like fall around our neck of the woods. Now this morning as I am writing this post, I get a notification on my phone saying, “RECORD HEAT WAVE…How hot will it get?” Come on weather and let’s get it together. Is it going to be fall or are we going to have summer heat a little longer than expected? It’s so hard to predict and believe it or not; I had a delicious soup planned for dinner tonight. I think we will end up grilling burgers or something now. I shouldn’t complain because life is great, but I was just starting to get used to the idea of it started to get cooler. Sorry about my short rant! Even though it isn’t perfect soup weather here today, I am still going to share this incredible low carb Zuppa Toscana soup with you! It’s one of my favorite soups at Olive Garden, so I knew I had to make a copycat of it sooner than later. After coming back from vacation, my body was seriously starting to hurt, and I knew I had to start my keto diet again. I have way too much too loose, and I should start to get serious about it. If you haven’t read my post about How I Survive My First Week of Keto (low carb ketosis) I highly recommend taking the time to read it. Matter of fact, I will be re-reading it as well because I need all of the tips I can get! So what makes this soup low carb? If you have ever had Zuppa Toscana soup before you know the main ingredients are diced potatoes, sausage, kale, and a flavorful broth. With that being said, it wasn’t hard to make this low carb Zuppa Toscana. I substituted the diced potatoes for fresh cauliflower florets. I haven’t tried making this soup with frozen cauliflower, and I am not sure how the cauliflower will hold up. I’m afraid it would be a little mushy, and that’s not the texture we are going after. I used hot Italian sausage, but remember to watch the sugar in store-bought sausage. Slow Cooker Low Carb Zuppa Toscana Soup - Skip the trip to your local restaurant and make a batch of this insanely delicious copycat soup! It's healthy, it's delicious, and it's made low carb! Perfect for a low carb and keto-friendly lifestyle! Brown the ground sausage in a skillet over medium heat until done. Using a slotted spoon, remove the sausage and place it into at least a 6-quart slow cooker. Discard the grease. Place the oil in the same skillet and saute the onions for 3-4 minutes or until translucent. 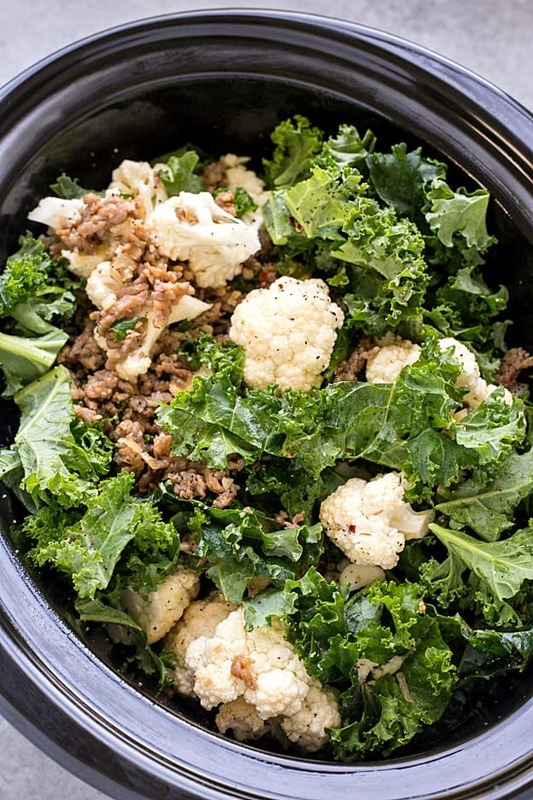 Add the onions, chicken or vegetable stock, cauliflower florets, kale, crushed red pepper flakes, salt, and pepper to the slow cooker. Mix until combined. The nutrition facts are an approximate estimate based upon the brands I used. Please calculate your own nutrition facts for the specific ingredient brands you use. 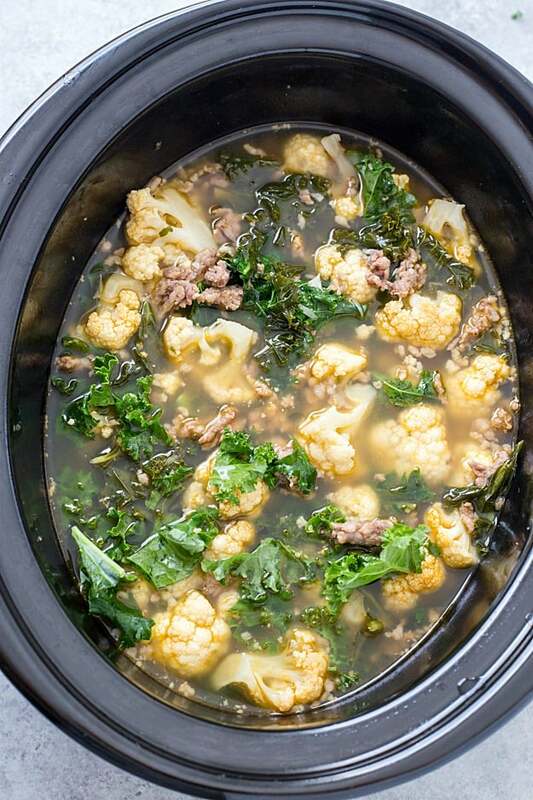 Thank you for your Zuppa Toscana Soup recipe……..we love that soup and this is the best recipe I’ve seen especially with the cauliflower. Since we are only two I will make only half the recipe……my question is: how long should half the recipe cook in the slow cooker? Great question, Susan. It will be the same cooking time in the slow cooker. Enjoy! I’m wondering if you could use sliced radishes as a potato substitute? Have you ever tried it that way before? I haven’t tried it before, but I think radishes would be a delicious substitute! I made this in my dutch oven on the stovetop and it turned out great too!! Very satisfying! Been recently diagnosed with diabetes and have to really watch the carbs. This looks good, can’t wait to try this. This was SOOOO Good and easy to make. Made this soup yesterday. I loved it! Super satisfying flavor for a low carb diet. Freezes well. I will definitely make this again! Great recipe. I just came across it.I was curious where you live.Most of us ,who are blessed to live on the west coast ,do not care for a cold winter.It is Feb 1st today and the thought of rain tomorrow is bringing me down.Im an LA guy-who actually loves LA! I used cauliflower rice substituted spinach for kale but used chicken sausage with kale in it..absolutely delicious!! Great recipe with a few subs. Starting a low(er) carb diet, and I came across this recipe during my Pinterest adventures. We made it tonight. THIS SOUP WAS INCREDIBLE!!!! It really did taste just like Olive Garden’s (minus the potato, of course). My husband doesn’t care for soups & absolutely LOVED THIS SOUP!! Heck yes! This recipe is going in my recipe box. Thank you!!!! A can of diced tomatoes! It was so delicious! Any on hand this time. I just made this today, but i also added in 4 dollups of cream cheese to melt into the soup. I have never cooked this before, and let me tell you what…… AMAZING!!! My husband even liked it and he doesnt like anything different typically. It turned out very good!!! I might make it again in the slow cooker, just know now to expect the kale to look more like cooked spinach. I made this recipe last night and it is so yummy I almost ate it for breakfast! It has such a great flavor. Will absolutely make this again! Loved it! I will use about 1/2 pound of sausage next time. And I added a ton of kale, way over the 3 cups. Also I had half and half on hand, so thats what I used instead of heavy cream. I also omitted the garlic. Loved the cauliflower and loved the crockpot method. I’ll make this again. I love this soup! I’ve always made it with potatoes but since starting to eat the Kito way I haven’t made it. I tried your recipe but only with Jicama (was trying to get the potato cosistancy) instead of cauliflower. Was disappointed. The Jicama was like a uncooked potato in the soup. Hard not soft. It tasted ok but just not like a potato. Try using celery root as a potato sub. Lower in carb and pretty tasty. It is used in the Adkins Turbo diet soup which is really good too. This soup was deliciousand definitely a keeper, but I only cooked 5 hours on low as the fresh cauliflower was still mooshy. Next time, well throw in the cauliflower the last hour or so. Other than that, this was beyond yummy. This recipe sound interesting. Since I hate Kale I will sub in Baby Spinach. It should be very tasty. I do love spinach. Just had this tonight!!! Absolutely delicious!!! !Thank you!!! Made this soup today. It was amazing! Full of flavor! I wasn’t sure substituting the potatoes with the cauliflower which makes this low carb, but I feel it made soup even better. Love this recipe! I changed it up a bit: Roasted the cauliflower at 425 for 20-30 min, and then I cooked it in my Instant Pot (sauté same as recipe and then 20 minutes on high). Among my favorite recipes! I’ve made this soup lots of times and it’s wonderful! It’s flavorful and hearty enough that you don’t miss the potatoes at all (I’m a carboholic, so that’s saying something), and it’s the only way I’ve found yet to get my teenagers to willingly eat kale. Thanks!!! I’ve made this recipe several times and I love it! But I’m wondering if anyone has tried substituting the heavy cream with a dairy free alternative and still had equally tasty results? I have dairy intolerant family members. I have made it with half and half before, and recently used a can of full fat coconut milk instead. It was delicious! You barely taste the difference. I just made this terrific soup last night. My only change was to use spinach instead of kale. It is AMAZING! Great recipe but I tweaked it a bit for preferences. I added diced red pepper and substituted spinach for the kale. I cooked the sausage then added pepper, riced cauliflower, onion, garlic and sautéed them all together. I skipped the crock put and added all the spices and liquids; since I have an extra deep frying pan I was able to do it all pot. All the benefits of a crockpot w/o washing one extra pot; saves a bit of time as well. Made this tonight,was very good! Hubby is a meat and potatoe kinda of guy, but he liked this and said he would eat it again. Do you have an instant pot version of this? I haven’t tried this in the Instant Pot yet, Tricia. I will be testing it soon! Haven’t tried yet but will soon it’s 7 degrees here 1/13/18 real soup and crock pot weather. Used the same recipe but in my pressure cooker instead! I will definitely be making this again it was so yummy! So glad you enjoyed it, Haylee! I just made this tonight and I’m obsessed! So delicious! I added almond milk and 2 dollops of cream cheese instead of heavy cream and added some chopped yellow squash. I added the ingredients on MFP and the nutrition was pretty similar just slightly lower calories. Excited to have my next bowl! Thank you for posting! I have made this recipe many times over. I make a soup pot full for lunches t or a quick meal during the week .I add a bit of red chili flake for some heat. Top with fresh grated Parmesan, just like they do at the restaurant. Since I started making this I haven’t been back to Olive Garden. I just made this. Really good and surprisingly filling. Just became a staple at my house. Thank you for posting this recipe! I made last night for the week for lunch and it is soo delicious! I don’t miss the potatoes at ALL. I did add a little more Red Pepper flakes to get it up a notch, but Definitely making this on daily basis. Thanks, again. So glad you enjoyed it, Kelly! It’s one of our favorites. Did it and honestly the cauliflower although was a better less fat option gave it a bit of a strange taste. I still preferred it than the full high calorie original. So I made this last night. However, being the potato lovers that my family is, we used potatoes instead of cauliflower. It was absolutely amazing. My grown up son told me it was the best soup he ever had… better than than Olive Garden. This will definitely be a repeat at our house!! Very good and very easy to make. I used mild sausage and that was enough heat for me. The crunch in the fresh califlower is a perfect substitute for potatoes. 5 stars! And, my family LOVES it-bonus! I made this in my instantpot and it was so amazing! I browned the sausage on saute mode, added onions until translucent, then garlic. Added other ingredients and cooked on high pressure for 10 minutes. Released pressure manually and added heavy cream. Truly outstanding! So glad it turned out for you, Niki! Will have to try it in my Instant Pot soon!